Monty says, “Somebody went out yesterday for the first time with decent weather. We had a lot of rain this week. We also had lots of wind except on Monday so getting out was tough. They did very, very well on northern pike. They headed toward McGuire Creek. They came back with 15 northern pike with a couple of 10 pounders. They found them at 25 feet depths using bottom bouncers. They also caught one crappie. They were bottom bouncing. A few salmon have been caught this week but not very big. to Sunday 7 am to 11pm. We are willing to open early or later than these hours depending on the need. We are excited to get people fishing and hear their fishing stories, “Monty says. Raymond says,” Fishing has been hit and miss. It has been more than normal of the last month people are saying. The water elevation is down a little to 3419 and the water was 65 degrees today. There is a decent bass bite. People are catching a few more crappies. Some people were using cranks. They headed toward south Rattlesnake. There are no reservations needed for camp sites it is now first come first take. The electricity and water are still on. The cleaning station is still open. Frog Pond is empty. There is no boat access there. “ . Our hours have changed. We are now closed Monday, Tuesday and Wednesday. We are open 8 to 6 on Thursday, Friday is 8 to 9 , Saturday 7 to 9. and Sunday we are open from 7 to 5 pm. There were people fishing out of boats more than from shore when the weather was decent. Not a lot of catching going on. The water is going down. *Due to a sudden illness there is no report this week. On Spring Creek the fall hatch is not abundant yet. So fly fishing is less productive right now. Spin fishermen are doing good. With the weather changing and getting cooler things will change. Use a night crawler or a lure. One that works is Jake’s spin a-lure. It has been hit and miss. Jim reports,”Fishing at Nelson has been good. Go to depths of 20 to 25 feet. They are using worm harnesses and a jig for walleyes. Guys are also catching perch. The perch caught have been 10 to 12 inchers. Wedded have rain so that effected the bite as well. I have not heard anything about Forchette. With the rain that had to change the fishing there I would think. ”. Jayce said, “My brother went to the Yellowstone going east. He got a dozen small mouth and 5 sauger. He was using cranks and Flicker Shads. On Yellowtail guys are catching a few saugers on the South end. Rich says,” I was at Crooked Creek last week. It rained some days. We did catch fish a few walleye and northern pike, cats, crappies, golden eye and drums. Most were at 20 feet depths. We caught more cats. The walleye were 15 to 17 inch size. We used a jig and worm. The fish seemed to like white best. Most days the weather was 60 degrees for a high. The water temperature was 62 degrees. I have heard people are still doing pretty well at Canyon Ferry. 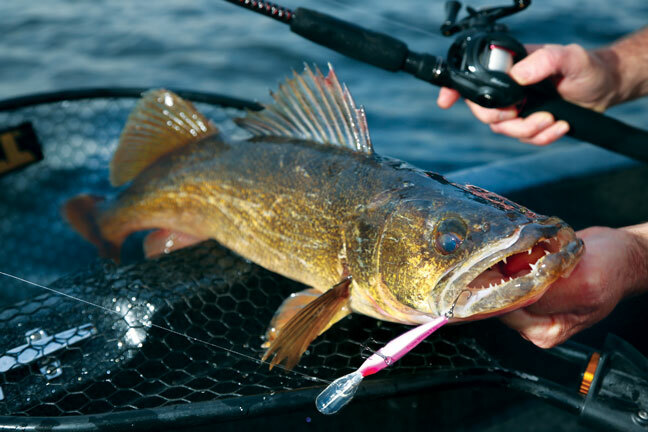 They are catching walleye pretty much anywhere. The alga is better. Jasmine says, “The Yellowstone is fishing okay. The cold did put a kink in the fishing a bit. Try using a Purple Haze or size12 hoppers. If the weather stays cool use a nymph with leg. Try a Prince or a Hairs ear. Look for caddis. The Stillwater is very low so wade and walk. We are seeing some very small bugs but it is not caddis or mayfly. The fish are eating them. Use anything smaller then 16. Hoppers are not working like they were before. People are expecting soon. If it comes use the emergers especially when it is a colder day. The water is doing something weird. We are seeing the water peak and then go down in the same day. That makes fishing a challenge and you have to really watch what is happening. Beau says,” The Big Horn I am told is a bit better. They say the grass is a little better fishing. I headed to the Yellowstone this week and fished. The Yellowstone is fishing okay. If you nymph as I did you can catch white fish, rainbow and cutthroat. Fish with grasshopper patterns or streamers as that is what is working. I found the color pink is working well. Overnight lows are below freezing, cooling off the water quite a bit. Once the sun warms up the water, caddis and blue winged olive mayflies are present. Terrestrial fishing has been great on the warm, windy afternoons. Higher elevation streams are fishing late in the day with mayflies and terrestrials. Bears are on the move; don’t forget your bear spray. Lower elevation streams are cooling off and fishing has been good most of the day. Caddis and some blue winged olive mayflies on the cloudy days. Remember no felt boots in Yellowstone National Park.